This course covers the methods and preparation for large scale commercial cultivation, followed by an introduction to cloning and propagation, vegetation, troubleshooting and harvest. Including an overview of desirable environmental parameters needed for a strong Commercial crop. Patient Services is the cornerstone to any great cannabis business. Ensuring patients are informed and satisfied creates loyalty and leads to success. 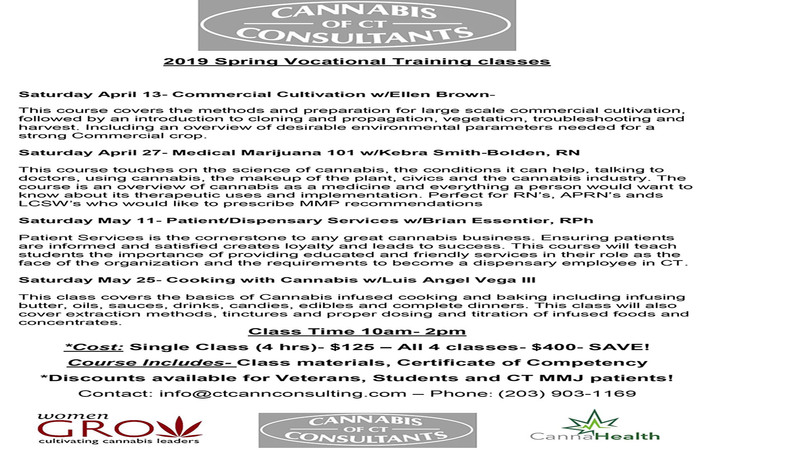 This course will teach students the importance of providing educated and friendly services in their role as the face of the organization and the requirements to become a dispensary employee in CT. This class covers the basics of Cannabis infused cooking and baking including infusing butter, oils, sauces, drinks, candies, edibles and complete dinners. This class will also cover extraction methods, tinctures and proper dosing and titration of infused foods and concentrates. *Cost: Single Class (4 hrs)- $125 – All 4 classes- $400- SAVE! *Discounts available for Veterans, Students and CT MMJ patients!